Brighton & Hove delegates support Glasgow homeless caseworkers! 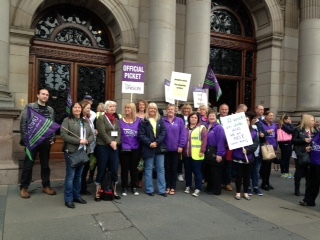 Brighton & Hove Local Government branch delegates at Unison’s national conference in Glasgow start each day by visiting the picket of the City Hall by members of the council’s homeless casework team, who have been on all-out strike for 12 weeks. The 72 caseworkers are striking over a regrading claim and the council’s attempt to cut their jobs. They were warmly welcomed at the national conference on Tuesday, being held at the city’s Scottish Exhibition and Conference Centre.